In this book John builds upon his discovery, described in Volume 1, of the plain of Troy in the lower valley of the Bakir Çayi. This valley lies in north-western Turkey to the east of the island of Lesbos, in a region known to the ancients as Mysia. At the head of this plain we see the magnificent acropolis of Pergamon towering above the lower town of Bergama. Volume 2 is in two parts. In Part 1, John shows how Pergamon perfectly fits the description in the Iliad of the holy acropolis of Ilios. On this steep and windy hill, Priam King of Troy had his great castle, and his son Paris lived there with Helen during her stay at Troy. On the topmost terrace of Ilios was a holy precinct of Apollo. Homer called this precinct ‘Pergamos’, and some 2,700 years later the acropolis still bears this name. The lower town of Troy must have been in the northern suburbs of Bergama. It will be probably be found close to an ancient geothermal spring, known in antiquity as the Asklepion. In Part 2, John presents evidence to support his theory that the Pisistratid tyrants, rulers of Athens from c560 to c514 BCE, were responsible for the ‘Troy deception’. They deceived the world into believing that Troy was not in Mysia, but was instead at a place where it was visible from Samothrace, and on the Hellespont near the islands of Imbros and Tenedos. They claimed that Troy was once on the site of Classical Ilion, today known as Hisarlik, in a region earlier called Sigeum. The tyrants, ably assisted by a few of the best poets of the day, compiled Homer’s poems into the two great epic poems we know today as the Iliad and Odyssey. While doing this they inserted many new verses, some new geographical signposts, and some political propaganda. The new geographical signposts, such as being visible from Samothrace, effectively ‘moved’ Troy from Bergama to Ilion. The propaganda enhanced the role of the Athenians in the Trojan War. Then they claimed that, in recognition of the military support they provided during the Trojan War, the Achaeans awarded the lands of Troy to the Athenians as the ‘spoils of war’. After the Pisistratids captured Sigeum from Lesbos by force, they were then able to use the authority of Homer to retain this territory. In this way Athens acquired a new and desperately needed colony for their expanding population. John also suggests that, in order to make this deception more credible, the Pisistratids had to rewrite parts of early Athenian history. A century later, in the era of the new democracy, it became fashionable to obscure and diminish the achievements of the tyranny. New traditions arose which effectively re-wrote Athenian history yet again, with Solon becoming their new cultural hero. 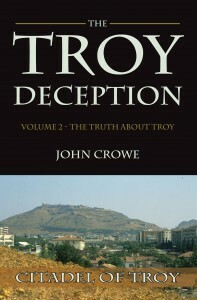 Thus the later Athenians, probably unwittingly, made the Troy deception even more difficult to detect. In his speculative revision of Athenian history, John offers a new and coherent scenario. He hopes open-minded scholars will find it much more convincing than Troy at Hisarlik. Everywhere it touches the known facts it seems to fit them like a glove. This new scenario, revised in due course where necessary by the experts, may be seen as an important advance in Homeric studies. Here, as opposed to Troy at Hisarlik, is a stronger platform upon which to build our understanding of ancient Greek history.